The portrait was created in a rather freestyle manner. She is impressionistic. Renoir was able to create the image of a fragile, romantic girl, which is permeated with an instant of incredible freshness. The artist focuses our attention on the face. He painted his hands quite blurry. It seems that he deliberately defocused them. Also exactly the painter blew and the distant plan. Renoir preferred to designate it only with indefinite strokes, which resemble pastel technique. As for the color solution, it is really minimalist: there are no colored paints. The viewer is not distracted from the perception of the image itself. Predominate in the picture: white, red and black. With the help of them and create all the necessary accents. The lips are bright red; skin, striking whiteness; deep black eyes and luxurious hair. All these details of the image simply can not bewitch. Lips slightly open. This makes the image lively. It seems that through the dress you can see glimpses of delicate skin. The contrast of black and white is based on the principle of chess. We feel the canvas pulsing. Light is pumped from one part to another on the canvas. We can notice this unusual glow in the flashes on the arms and neck, which are difficult to notice. The features of the girl are distinct. The portrait is deliberately highlighted. A fan of white color, a pale face, a background – they give a single solution in terms of picturesqueness. The image is beautiful. This splendor is born from the bizarre game of some nuances and a special combination of colors. Renoir liked to write out every fold in the smallest details. We do not see the folds of clothes, but in drawing an elegant fan this manner is felt. 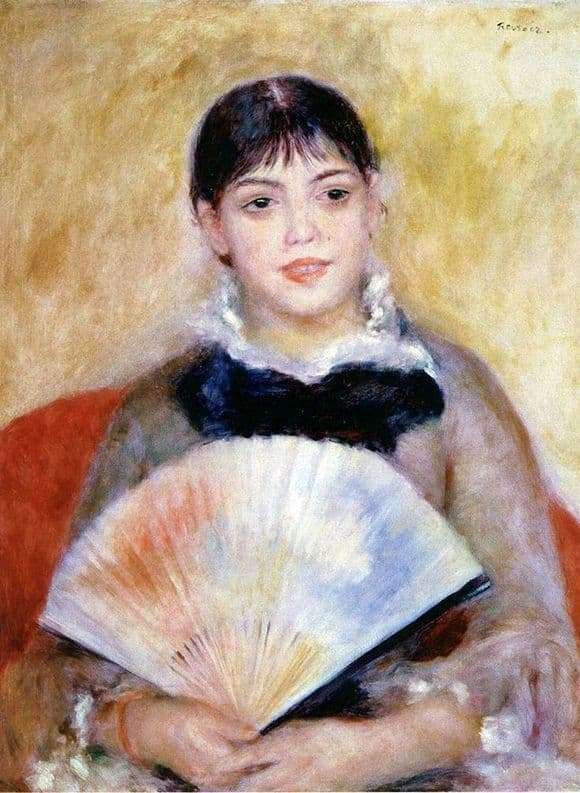 It is no coincidence that the portrait is named “Girl with a Fan”. This detail completes and complements the image, emphasizing its originality. The portrait is enriched and the impression of it is enhanced, precisely because of the fan. The image becomes more interesting.